Fudge is one of the things I usually only make around the holidays — and certainly only in the colder months, as fudge never sounds appetizing to me in the hot summer months. And since Dave and I both have a pretty strong sweet tooth (that we’ve apparently passed on to Nora) fudge is definitely a favorite holiday dessert and snack in our home. Plus, since most of the recipes I have for fudge make A LOT — it’s a great treat to have on hand for last-minute guests, holiday parties, or even to give as edible gifts. 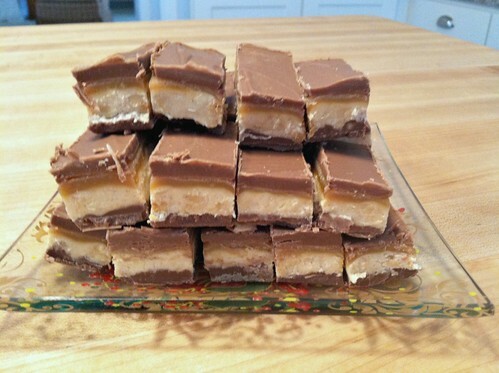 One of our family’s favorite fudge recipes is this 4-Layer Caramel Peanut Butter Fudge — and yes, it is as rich and delicious as it sounds! It’s extremely easy to make with easy-to-find ingredients… but it does take a bit of patience as each layer needs to cool and harden before you can add the next layer. However, I can assure you the time is totally worth it as this fudge makes a huge 9″x13″ pan and will last for WEEKS in the refrigerator (if you don’t eat it all first). With layers of chocolate, peanut butter and marshmallow, caramel, and more chocolate, there’s something for everyone in this delicious fudge. And if you’re allergic to peanut butter, you can easily substitute your favorite peanut butter substitute, and then RiceKrispie cereal in place of the nuts. Makes approximately 48 – 96 pieces of fudge; depending on how you cut it. In a medium sauce pan, combine milk chocolate chips, butterscotch chips and peanut butter. Cook over low heat, stirring constantly, until melted and smooth. Spread evenly into a lightly greased 9″x 13″ pan. 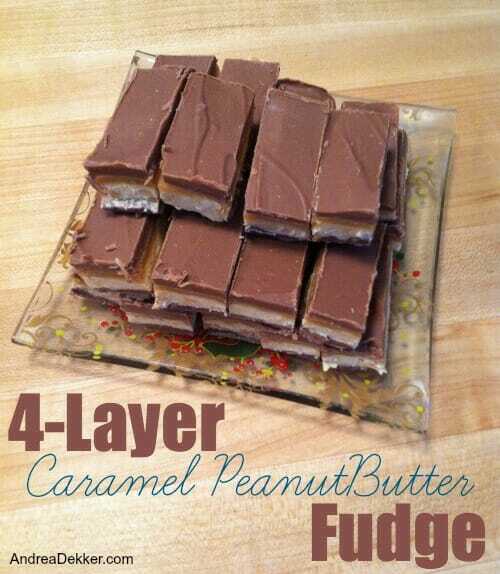 Put in refrigerator while you prepare the next layer. In the same sauce pan, melt butter over medium heat. Stir in sugar and evaporated milk. Bring to a boil and let boil for 4-5 minutes. 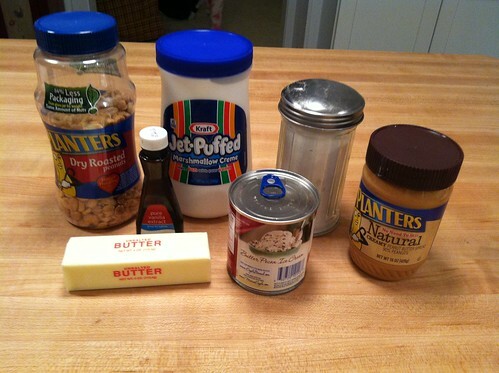 Remove from heat and stir in marshmallow creme, vanilla, peanut butter, and peanuts. Spread evenly over layer #1 and refrigerate while you prepare the next layer. In the same sauce pan, combine caramels and heavy cream over low heat. Cook and stir until melted and smooth. Spread evenly over layer #2 and refrigerate while you prepare the next layer. 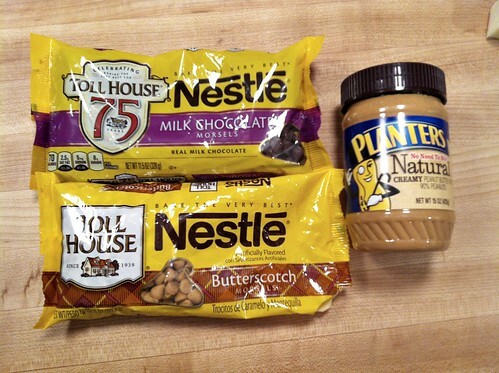 In the same sauce pan, combine milk chocolate chips, butterscotch chips and peanut butter. Spread evenly over layer #3 and refrigerate until set (at least 1 hour). Cut into small pieces and store in a sealed container in the refrigerator. 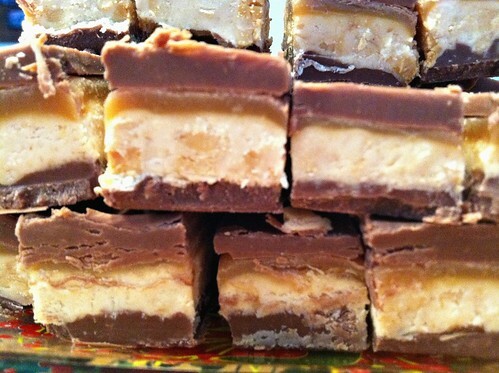 I brought this fudge to a few different holiday parties — all with rave reviews. Then Dave requested that I keep the rest at home for us to enjoy for the next few weeks. It’s just the perfect combination of sweet and salty, creamy and crunchy, ooey and gooey, chocolate and caramel…. I think you get the idea. What about you? Do you have a favorite fudge recipe? Just tried this recipe and I concur it’s delish? Have you ever made with semi-sweet instead of milk chocolate chips? I have to admit my clan prefers semi-sweet/dark over milk chocolate. Thanks. yes! Many times. I definitely prefer semi sweet and dark chocolate over milk chocolate — but milk chocolate does go really well with caramel and peanut butter! Glad you liked the fudge!! Made this over the weekend and popped MOST of it in the freezer 🙂 We had a cooler weekend in WI so it was nice for getting a little pre-fall baking done! Thank you for the great recipe, we loved it! Hope you enjoy the rest this fall! 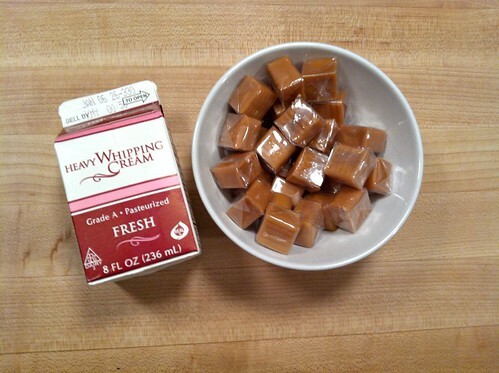 I saw this fudge recipe of yours. It looked so delicious that I had to try it. Even though I was first lost not only because of the ingredients but also because of the measures. I live in Switzerland and this was the first American recipe I tried. 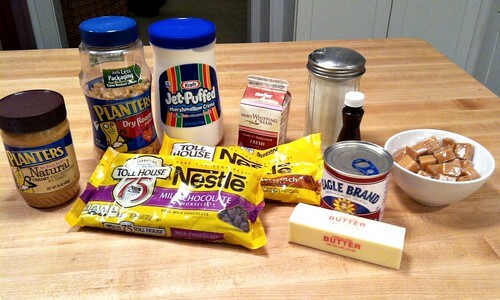 Through the Internet I found out about how much gramm of each ingredient you used, though it was quite a study. To get hold of the ingredients was a bit more tricky. Fortunately I always buy Fluff in Germany whenever I can when we go over the border to shop. So that one was easy and already well known. And just by the way I stumbled over butterscotch in the Netherlands on my last holiday. (Didn’t know butterscotch till then) Not to mention that here we do not really know fudges at all. It is nothing very common in continental Europe. So with all those difficulties I think the fudge came out very well. Though no idea if an American would really agree. I like it. These are out of this world delicious! Perfect for the cookie exchange I am hosting! I cut them too small for my cookie exchange (don’t want to look skimpy!) so I guess I will have to make them again! Darn! 😉 A helpful tip is when measuring out the amounts for the first layer measure out the same amount again and put into a bowl for the 4th layer. Saves time! Thanks for your great posts! I saw the mention of this in today’s post so went over to read the details. I am taking part in a cookie exchange next week and after reading this, am considering seeing if the others are up for fudge as part of the exchange. Do you think this would make a good item for a cookie exchange? If so, how many would you plan to cut from a 9×13 pan, knowing you were going to divide them out into plates of 12. Thank you for any thoughts you have on this. Heather, this fudge is AMAZING!!!! I hope your friends let you include it! In the post, I said anywhere from 48-96 pieces of fudge per batch (depending on how you cut it). I usually cut mine 1″ x 2″ so that would give me 9 across by 6 down — or about 54 pieces. However, you could DEFINITELY cut them smaller than that. This is very very rich fudge! Okay, so I tried these about 2 weeks ago to give away. We ended up eating a few and tonight I made my third batch!! These are RIDICULOUS DELISH and even my picky, I only like milk chocolate fudge with nuts Mom loved them…more than regular fudge!!!!! Thank you so much for sharing!!! yay — thanks for sharing!! So glad you (and your mom) are big fans — this fudge IS amazing! Thanks for the quick reply! Yes I copied all the uses for dry milk that you linked to and will be using it. You have great ideas. I’m a grandma now but love all the things you do! Never to old to learn something new. I live in Tennessee. 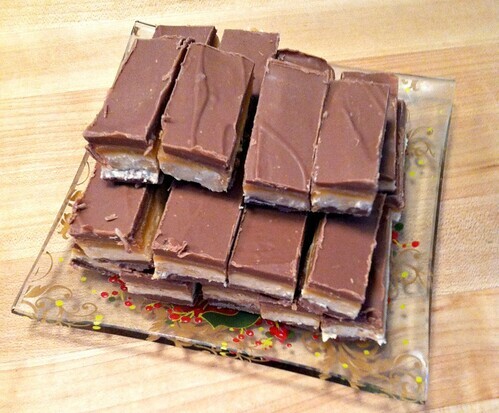 I made these the other day and I have to say they now probably top my list of favorite sweets. (And I really LOVE schotcheroos!). They are so good. I store them in my basement frig (so they aren’t so easy to access) and then I bring up a couple at a time. My daughter loves them too and posted a picture of one on twitter to show her friends. I have also made several of your soups and other recipes in your recipe box so thank you for the ideas! My husband and I make these every year at Christmas time. They are like a Snickers bar, only better! Last month we made up a batch of these and put them in a decorative Christmas box and gave them out as teacher gifts. It makes a large batch and worked out well since our children have several teachers and para professionals that work with them. This looks amazing! I am going to try making it for the “Superbowl” party we have. This sounds amazing! chocolate and peanut butter together are never wrong!!! I will be adding this to my gift giving with cookies and cakes! Thanks so much Andrea! Yum! I have a sweet tooth too so will have to give this a try. Anything with chocolate is a favorite of mine – and I do love fudge with the chocolate-ness of it all!